Attendees of UC Santa Cruz’s Inventing the Future of Games 2013 symposium were able to play Prom Week with the creators on hand to answer questions. 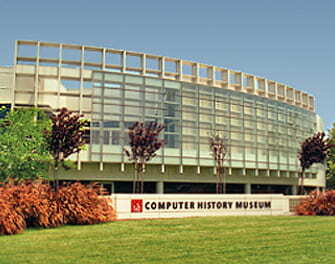 The symposium took place on the upper levels of the Computer History Museum in beautiful Mountain View, California. It was an honor to showcase Prom Week at this confluence of an event heralding the future and a location celebrating the past. With any luck, we hope that Prom Week will one day be featured on the lower level of the museum, as an important turning point in the history of interactive narrative. We’re proud to report that our paper on Prom Week, Prom Week: Designing past the game/story dilemma, was accepted and presented at the 2013 Foundations of Digital Games Conference in Crete, Athens this past week. 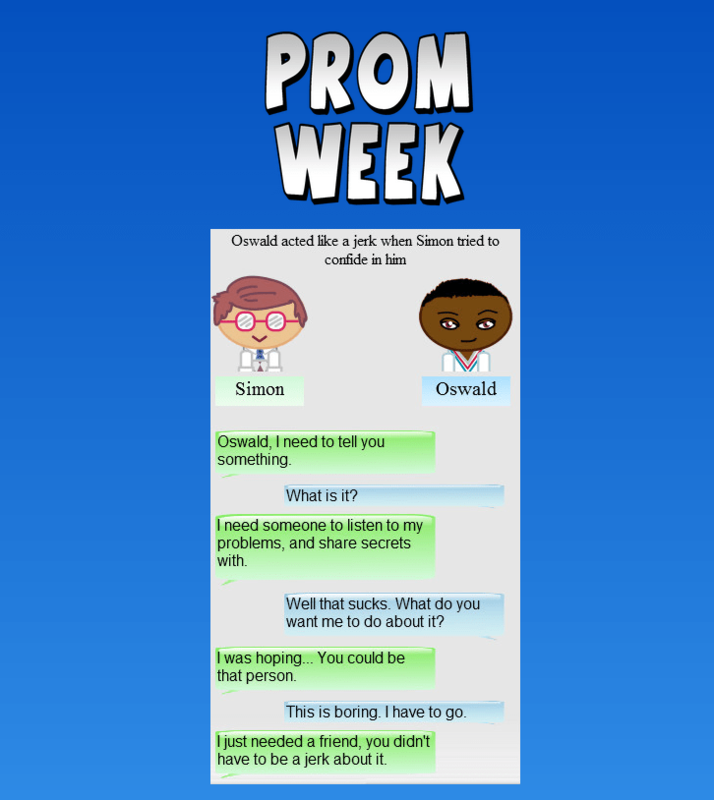 In addition to providing an overview of Prom Week’s general mechanics and social physics, this paper tells the story of Prom Week’s humble origins as a paper prototype, and how it grew into the achievement in interactive story telling that we know of today. Although other papers have been published on the subject, we view this as the definitive paper on Prom Week itself as a playable experience. But don’t worry! There will hopefully be many additional publications on the way covering both Comme Il Faut, as well as further user evaluation to measure Prom Week’s strengths for use in future work. And we would be remiss to not offer a nod to the fact that actual Prom season is upon us once again! To all the real life Zacks, Monicas, Chloes, and Gunters in the world, we wish you a happy and safe Prom night, with all your social goals fulfilled and satisfied! The title pretty much says it all! We’re pleased to announce that the folks over at AiGameDev have done us the honor of selecting Prom Week as their pick for Best AI in an Independent Game, as well as nominating Comme Il Faut’s social physics for the category of Design Innovations in Game AI. As always, team Prom Week is humbled and honored by the recognition. And be sure to check out the full list of winners and nominees! Prom Week Wins IVA GALA! We are pleased to announce that Prom Week won the Intelligent Virtual Agents 2012 GALA demo and video festival! It’s a win that we hold near to our hearts, since after all, what is a Gala but a slightly more refined Prom? Though here GALA actually stands for Gathering of Lifelike Agents, so perhaps the connection is simply a coincidence. Regardless, all of the entries were phenomenal (and even included Lead Gameplay Designer Mike Treanor’s other Project, Game-O-Matic! ), so we are extremely pleased and flattered that the votes fell in our favor. And finally, all of us here at Team Prom Week, and the Center for Games and Playable Media, are eagerly anticipating IndieCade–hopefully you are too! To help get all of us in the IndieCade mood, check out this nifty little seal of IndieCade Finalist approval! 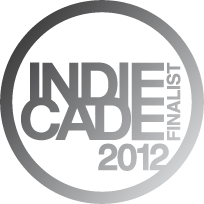 We couldn’t be happier to announce that Prom Week has been selected as a finalist in the 2012 IndieCade Festival! After our terrific time at the IndieCade E3 Showcase, we’re humbled and honored to have been invited to the full festival! There is a fantastic line up of games at this years festival — be sure to play them all! For those who missed it, Prom Week had the honor of being selected for this year’s IndieCadeE3 Showcase, and we couldn’t have been happier with how it went. 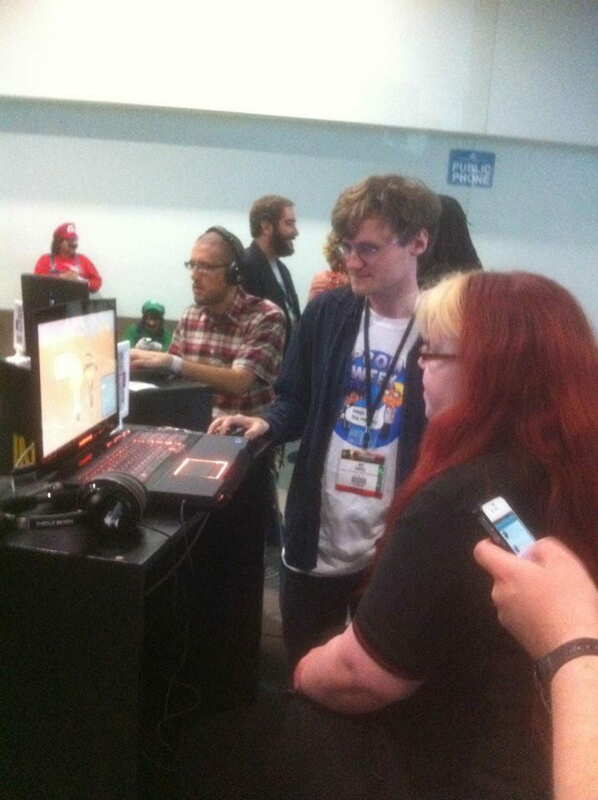 IndieCade Director Sam Roberts, Akira Thompson of Gamemaker Relations, and a stalwart team of enthusiastic and dedicated volunteers ensured that we had all the amenities necessary to demo Prom Week to a near constant stream of press and players throughout E3’s three days. We’d like to share with you some of our E3 coverage! Wired.com includes us in their list of 7 Indie Games that Rocked at E3, which is an honor we accept graciously. The article also describes me (Ben Samuel) as having an infectious laugh, which is nice. By the end of day three, my voice was obnoxiously raspy. It also likens me to Harry Potter, which I don’t need to tell you is another high honor seeing as the world universally agrees that Harry Potter is a very dashing young man. Videogameinfo.com takes you on a personal tour of over eleven minutes of Prom Week gameplay footage. You can’t really see it, but I’m just off camera, pantomiming advice to the gentleman in the background, who is then trying to interpret it and relay it to the woman playing. They also, within the first minute of playing, find a typo! Rest assured, that restaurant with the unlimited bread sticks will be getting their act together and serving a more traditional dough-based appetizer in the next patch. Turnstylenews.com includes Prom Week in “a short list of games that “piqued [their] interest”, and goes so far as to say that “innovations in [Prom Week’s] kind of gameplay are sorely needed in industry right now” and that “Systems that allow for intricate social structures and dynamic narrative designs are a balm a field that has become dominated by carbon copy first person shooter play needs.” Another fun fact — the photo at the top of the Indiecade page was taken directly in front of where Prom Week was set up! When you look at that photo, you are seeing exactly what I was looking at all three days. It’s almost as if we were there at E3 talking about Prom Week together! Gamefront.com Has us in a list of three of their favorite games at IndieCade, which is great! Although I believe the ‘cringe’ in the title of the article is referring to us, so I apologize for any discomfort we may have caused the author. And I also feel compelled to remind readers that getting a date to Prom is but one of many challenges Prom Week offers! IndieGameMag.com provides a quick look at all 20 games on the IndieCade floor. Although Prom Week only makes up 1/20th of this list, 20/20ths of this list is overflowing with brilliance and innovation, and I highly recommend giving them a try. Although I wasn’t able to play all of them myself, I had exceedingly pleasant conversations with the folks behind Dawn of Cimmeria, Hokra, Languish, The Moonlighters, A Mother’s Inferno, Songlines, A Valley Without Wind, and Who Took the Apple. All of them seemed to be great games (or great games in the making! ), and it was a real privilege to have the opportunity to set up shop beside them. Indiegames.com offers an excellent overview and impressions of Prom Week. It also describes the game as a “crowd favorite”, which is reassuring, as it certainly felt like there was a good amount of people playing the game! It’s nice to get some external validation on that front, as I was a little nervous that my enthusiasm was tricking me into thinking that there were more players than I thought. Gotgame.com showcases another five minutes of gameplay footage, so you can compare and contrast how different reporters chose to play the game differently! Also, though not strictly pertaining to E3 but still incredibly cool all the same, Prom Week got a write up in Edge magazine! Lead gameplay designer Mike Treanor does a fantastic job describing Prom Week, Comme il Faut, and other cutting edge games research happening at UCSC’s Center for Games and Playable Media. 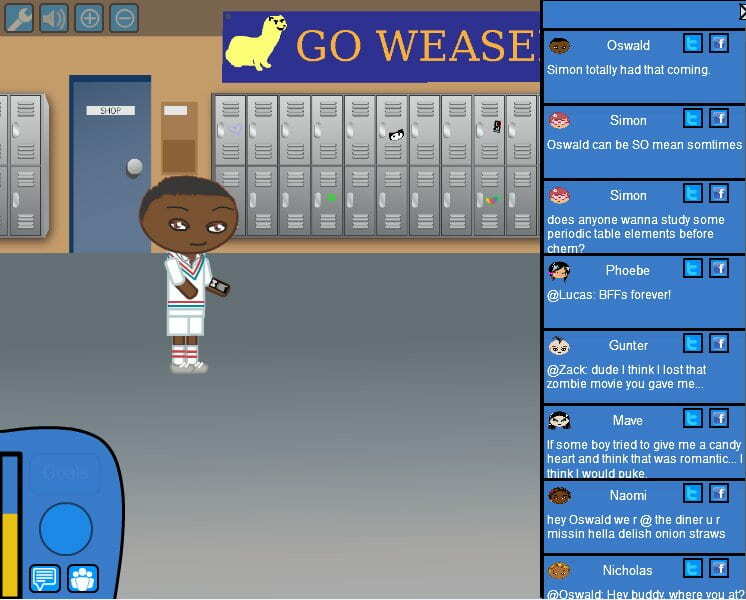 Finally, we have Reelseo.com which gives a nod to Prom Week, but, ah, also recognizes me from Battleground and namedrops me! And if lil’ ol’ me getting name dropped wasn’t enough, it is dropped in the same breath as, y’know, *actually* famous people like Wil Wheaton and Felicia Day. So that was neat. I also had the good fortune to meet up with several good friends, including Alison Haislip of Battleground, G4, (and a plethora of other sources) fame, ComicsOnline.com ace reporter Kroze Kresky, and Tyler Wilde, who is not only an associate editor at PCGamer.com, but also a dear friend from high school that I hadn’t seen since, well, just about my own personal Prom Week. On behalf of all of Prom Week, I’d like to once again thank Sam Roberts, the entire IndieCade team, and all of the members of the press and public that took the time to play around with Prom Week. The event was an absolute blast, and I think we successfully demonstrated what makes Prom Week cool. Now, fingers crossed that we make it into IndieCade in October! Prom Week Selected for E3 IndieCade Showcase! We are very happy to announce that Prom Week has been selected to be a part of IndieCade’s E3 Showcase. If you happen to find yourself at E3 this year at the beautiful Los Angeles Convention Center on June 5th-7th, stop on by and say “hi”! Chat with us about Prom Week, Comme il Faut (the AI system which powers the game), interactive storytelling, or just high school in general! We’ll be located at the Concourse Foyer, which is in the convention center’s Level 1 West Hall Entrance. This seems like a perfect opportunity to break out this lil’ picture again. High fives for everyone! A huge congrats to all of the games at the IndieCade E3 showcase! Be sure to check out the full list of selected games (as well as a nifty color coded map of the Los Angeles Convention Center). As alluded to in our Last Post, we’ve been hard at work making Prom Week better than ever. Not only has this involved tackling bug fixes, but it’s also involved the development of brand new functionality, the first of which we are proud to announce today. Oswald is tweeting already. Are you? If you’ll forgive a brief lapse into old-fogey-tude, it seems like all the kids today just can’t stop talking about their social media! I mean, heck! You can’t even surf down to your corner webpage without being presented with how many people ‘like’ it! And they are always going on about ‘posting’ this to their walls, or ‘tweeting’ this to the tweetosphere. Man. Kids today are so cool. Well, with this latest push, you TOO can contribute to the social media arena, from the comfort of your very own Prom Week! 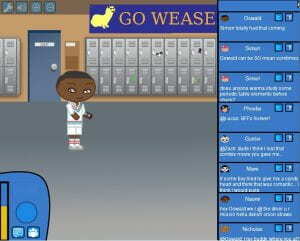 The next time you log in to Prom Week, either on Facebook or on Kongregate, after social exchanges, you’ll now be presented with the option to share either a summary of what just transpired to all of your friends via twitter, or to share a link to the *entire dialogue exchange* with all of your friends on your Facebook wall! Through using Prom Week social media integration, your friends will be delighted by your ability to recognize funny things, and your enemies will want to become your friends and will therefore soon afterwards be delighted. Programmatically generated transcripts of your favorite social exchanges, to share with friends and cherish forever. You can also tweet and/or share on facebook the Social Status Updates that the Prom Week characters themselves seem to care so much about. Now you can help spread the word about Naomi’s opinions on glass roses and Buzz’s love of Japanese swords. And rest assured, this update is purely in the interest of some silly fun, and for sharing exchanges that you are particularly proud of. You won’t be penalized if you ignore the new social media features, nor is there any reward for making use of them. Well, no reward besides the fun of sharing a laugh over the plights and triumphs of some goofy cartoon high school students with your friends, of course. That said, consider this an appetizer for several more tantalizing Prom Week update-dishes to come! We’ve been cooking up some new features that should make the game quite delicious indeed, especially for those of you who may feel that the game currently has been peppered with too much difficulty. So stay tuned! And hey, since we’re on the subject, feel free to follow us on twitter @Prom_Week, or yes, ‘like’ us on Facebook at facebook.com/promweek. Finally, for those of you may have have stumbled upon this site without knowing what Prom Week is, this video serves as a great primer for the world of the game and the “social physics” which power it. Enjoy! Long time no see, everyone! I hope this blog post finds you well. It’s been an exciting time since our last update, including a trip to the Independant Games Festival at the Game Developers Conference. Although Prom Week didn’t take home the grand prize of Technical Excellence, it is–as they say–a supreme honor to even be nominated. 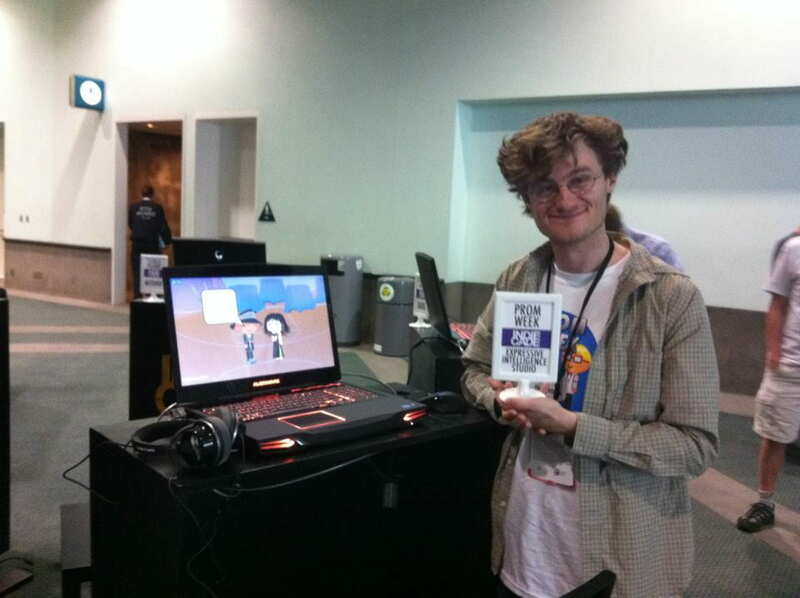 Thank you for all of the support you showed us for the IGF audience choice award! 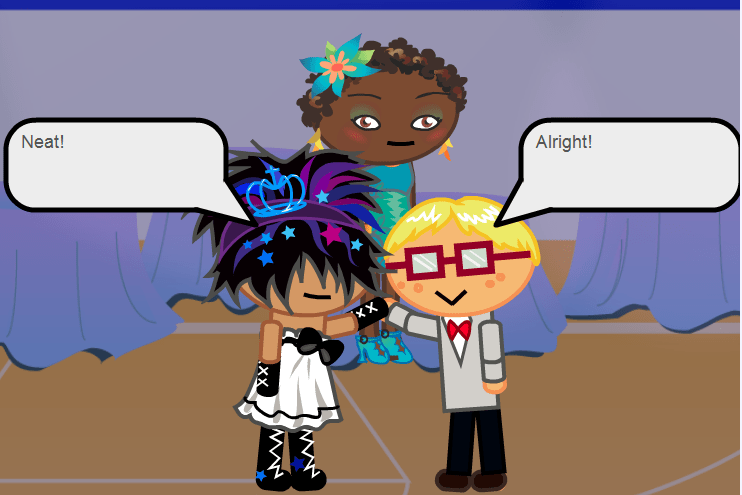 Team Prom Week has been hard at work developing some new features and bug fixes, so stay tuned. In the meantime, check out our new video which illustrates the fundamentals of Prom Week and Social Physics.